In your case I would probably execute it now. Generally when you cancel a reservation with a cert it resets the expiration so you should probably have some leeway. Here's my situation: I would like to redeem a Travel Package for 7 nights and 120K United Mileage Plus miles. I have a hotel in mind, currently a Cat 8, which will become a (new) Cat 5 on 1 August. I would like to stay there in late July of next year (2019) but realize I can't confirm a redemption reservation in July before the change on 1 August. I also note that the "cost" of airline miles as a part of the Travel Package will go up from 1 MR point to 1.5 MR points per mile on 1 August. Essentially, I have two choices: Redeem a Cat 8 package before 1 August for 360K points, and attach the certificate to a reservation in June 2019. This gets me the 120K United miles, and with luck (since I will have spent 240K points on the hotel portion, a reservation that would cost only 210K points after 1 August) they'll let me move my reservation one month to the right next year without charge. Or: Wait until late August and -- using the new redemption chart -- redeem 7 nights at the new Cat 5 rate and 120K United points (if the 10% bonus is still in effect next month, something I've been unable to confirm) for 390K points and attach the certificate to a reservation in late July 2019. It seems to me the first option (redeem before 1 August and hope) is the better one. I'll have the miles in my account, and I hope I can move the reservation at no additional cost (or if really lucky get a voucher for the 240K points from the Cat 8 reservation that I can use against the 210K cost of the Cat 5 reservation). As a back-up, I'd plan to find out what the new rules will be, and if they result in a substantial penalty to move the reservation (at the same property), try to rearrange my plans for next summer to stay at that hotel in June as reserved. That may be possible, but the property is in Europe, and I'm not sure how flexible I can be on the June versus July stay. You get 132K United miles, 10% extra. If I were in your situation I would go for the first - redeem TP now and book hotel with certificate then ask to move dates when your dates become available. redeeming package at 360K points instead of 390K points in August. You've already outlined the risks sufficiently. The greatest one is that you might have to change your travel plans to June from July. If it were me, I'd redeem now, trying to be patient and waiting as long into the month as possible. I'd certainly want to wait til I am less than a year from the dates you'd ideally like to stay in 2019. And by being patient, perhaps Marriott will clarify some of the issues before you redeem so that you know if this remains the right decision. I believe it is sloppy editing that causes the discrepancy. Pretty certain it means 10K, 10% of the 100K on the new chart. I would so what SanDiago1K suggests, redeem before August 1st but wait patiently till last week of July to do the redemption, in the hope that Marriott might release more information to lots of still missing details. NOT TRUE! I have booked 7 CX awards to/from South Africa, Australia, Asia & North America in the 9 months you say they were zeroed out! NOT TRUE! I have been watching city pairs and CX availability does appear to be coming back. Last week when I checked JFK-HKG there was no CX award availability in any cabin even close it. Now there is F & J open 3 months out in October and 5 months out in December. HKG-SIN availability every day in October. October 11th, 8 of the 9 flight that day have J. Granted some city pairs don't appear to have availability now just like JFK-HKG didn't last week. I hope those will come back too. Making a blanket statement that they are NOT coming back is WRONG. Before you are yelling Not True, you need to read more carefully. I never say CX zeroed out availability since 9 months out. I said the availability has drastically reduced since 9 months out. Drastically reduced is NOT Zeroed out, but is definitely a very noticeable reduction from before when one routinely sees 5J or even 7J, no number attached J (wide open cabin) showing on BA site. That was how CX used to be, from experiences of years of using AA and later AS programs. Talk about booking CX using either AS or AA miles, I dont think you would have booked / flown any more CX award flights than I have done. For the past several years we average 2 to 3 CX trips to Asia, and we used CX to/from JNB 2 times in 2015, 1 time each in 2016 and 2017, plus our favorite usage - EU-HKG flights, and numerous intra-Asia flights, with AA, AS and BA currencies. So I believe I know what I see and how I "feel". What I see and "feel" so far has been depressing. I can tell you that just 3 years ago I would only decide whether I wanted to go for NY or CNY until 1 to 2 months before the dates and there still plenty of J seats to choose from. Even as late as early 2017 the picking was still far far better than the 9 months leading to June 2018. It has been very tough the past 9 months, especially since the beginning of 2018. It feels so bad that I start to look for alternatives such as BR, NH, or even with Aeroplan, route thru Europe to Asia as possibility instead of fixating on the AS program because we do have some needs to visit HKG. I just hope others who are not familiar enough on the current situation (reality) to think more and with an open mind. 'nuf said. The complete zero out started 6 to 8 weeks before June 22nd. My last booking on CX award seats was done on March 9th. Picking was slimmer than I thought. We left home for a month long trip starting first week of April. 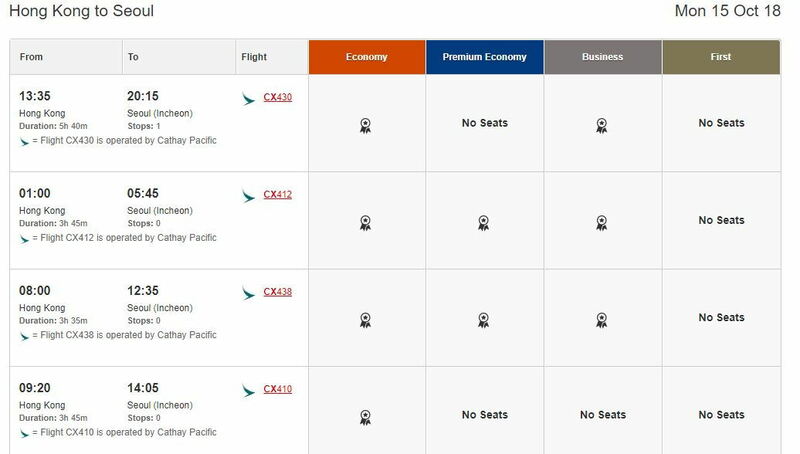 Upon return when I checked the availability and was shocked to see there were no premium cabin seats on many routes, incl the most reliable ZRH-HKG, and HKG-ADL, not to mention the US-HKG routes. A friend needed to change a date on her already booked LAX-HKG flight, and a HKG-ICN flight, she had to stay up at night and tried 3 times, before she was able to find a date that was acceptable, to make a change at the edge of booking window. It has never been this hard in the past. Oh yes, she used up her one shot free change with AS program because the change was done after June 5th. The availability has NOT returned despite you claimed you have seen those. I posted on the AS CX thread trying to find the availability you claimed was showing for Oct 18, JFK-HKG. They are NOT there between Oct 8th thru Oct 23rd. I am holding a booking on Oct 24th and looking for earlier dates so I only checked what I would need - there were only PE available if there is any availability. Weekends there is no seat for any class. I dont believe the availability is all snatched up by people who are looking if they so available as you claimed. More like a reloading CX did unintentionally based on the old formula but later realized that wasn't what they wanted and pulled the inventory off again. There is enough discussion on whether AS should be chosen as the miles for the Marriott TP. Enough Pro and Con have been listed out and readers can make their informed decision (or gamble). This also depends on how many miles you have in your various FFP account balances and where you would want to go, with which routing and such. If one does not have needs for certain program's miles in the next 18 months, there is no reason to pile up when you may have other means to add to your balances. On top of that, study the new chart and you may find some hotels you have good chance to use, may go down in categories. So you dont want to deplete your account just because the TP would devalue. Piling up miles in the account but not use them in time, is a self-inflicted devaluation in a way. I have enough points for a final Cat 1-5 Travel Package. Should I book it now or hold off another week or two to see if there are more details as to what happens after August 1st? My concern with waiting is that they might decide to pull booking the existing Travel Packages abruptly with no notice before Aug 1st. Do you think that is unlikely? [MENTION=70]If it were me, I'd redeem now, trying to be patient and waiting as long into the month as possible. I'd certainly want to wait til I am less than a year from the dates you'd ideally like to stay in 2019. And by being patient, perhaps Marriott will clarify some of the issues before you redeem so that you know if this remains the right decision. Thanks! I always greatly appreciate your advice and insight. And thanks to the others (including travelbugging who was kind enough to correct my math error). That is what I'll do. If all goes bad, I'll at least have the miles and can try to adjust my travel. I can tell you that just 3 years ago I would only decide whether I wanted to go for NY or CNY until 1 to 2 months before the dates and there still plenty of J seats to choose from. Even as late as early 2017 the picking was still far far better than the 9 months leading to June 2018. It has been very tough the past 9 months, especially since the beginning of 2018. I have no knowledge and can't speak of what the availability used to be like. My experience with AS award bookings on CX actually started in November of 2017 when I booked two J JNB-HKG//HKG-BOS 3 months out. All of my bookings have been since then. I never had issue finding premium cabin awards within the general time frame I wanted them. I do have flexibility in my schedule so I tend to go more with what is available than get upset that there isn't a seat for me on a specific day. Keeping an open mind there is prudent too. The complete zero out started 6 to 8 weeks before June 22nd. My last booking on CX award seats was done on March 9th. Picking was slimmer than I thought. We left home for a month long trip starting first week of April. 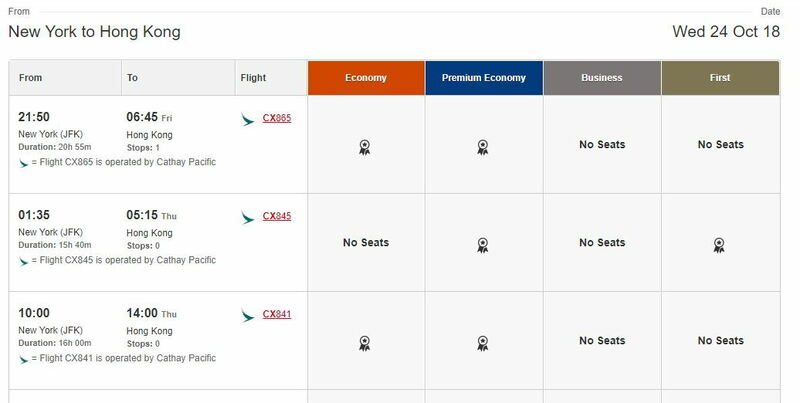 Upon return when I checked the availability and was shocked to see there were no premium cabin seats on many routes, incl the most reliable ZRH-HKG, and HKG-ADL, not to mention the US-HKG routes. This is where I have issue with your blanket statement. This simply is not true! (not yelling this time and it wasn't my intent last time, just emphasis!) If awards were completely zeroed out 6-8 weeks prior to June 22nd as you state, then I would not have been able to book CX 1F & 1J LAX-HKG//HKG-BNE on May 21st for February nor added CX F HKG-LAX to an existing MEL-HKG J award (booked on May 24th) on June 15th. The availability has NOT returned despite you claimed you have seen those. I posted on the AS CX thread trying to find the availability you claimed was showing for Oct 18, JFK-HKG. They are NOT there between Oct 8th thru Oct 23rd. I am holding a booking on Oct 24th and looking for earlier dates so I only checked what I would need - there were only PE available if there is any availability. On behalf of CX, I apologize that they don't have premium awards available for the dates that are desirable to you. Here again I have issue with you making a blanket statement that CX premium cabin awards have not returned by looking at a small range of dates that are of interest to you specifically. (I anticipate emphasis or are you yelling? ) I went back and looked at JFK-HKG and confirm that some premium cabin awards are available, just not between October 8th and October 23rd. My point was and still is that CX premium cabin awards, which were not showing last week are starting to show now. I checked HKG-BKK, and J is available almost every day of the month of October. Same for SIN and ICN. This evening I also see J HKG-PER and a trickle of HKG-SYD in Y & PE which wasn't there when I checked yesterday. While it may not be at the level you are used to, it is returning! On this point I agree, people should be making an informed decision; however, there isn't enough information out there to be properly and fully informed to make that decision. If you wan't to know with certainty, wait until the information is disseminated by the people making those decisions. Anything else is a gamble! Stating erroneously that CX awards were zeroed out 6-8 weeks ahead of June 22nd and that the awards have not returned just adds more crap to the plate for people to digest. Why did you single out AS? It is apparent that you are unhappy with CX because availability is not what you are used to. That is a CX issue, not AS, AA, BA or any other airline. I think you are being a little disingenuous suggesting that AS is a poor choice because of CX availability, which to someone with less knowledge of the current state of CX (reality) can be construed to mean that it is a result of AS. If one does not have needs for certain program's miles in the next 18 months, there is no reason to pile up when you may have other means to add to your balances. Not everyone is looking for CX premium awards to Asia, some are just happy to get out of a dark cold winter and spend a couple of weeks on a warm sunny beach. My point was to offer an alternative approach to "hedge" against any partner devaluations withing Mileage Plan. Do we get AS Miles now with a TP or do we wait? Now, 270K gives 120K AS + 7 night certificate, Wait, 270K gives 110K AS, Period. I'll take the extra 10K AS (return SFO-SEA) and the certificate. If I only use it for 1 or two nights I am ahead of the game. Of course if you only use Mileage Plan and don't fly AS your valuation probably will differ. On top of that, study the new chart and you may find some hotels you have good chance to use, may go down in categories. So you dont want to deplete your account just because the TP would devalue. Piling up miles in the account but not use them in time, is a self-inflicted devaluation in a way. I have studied the new chart extensively, thank you very much! Just like I have been watching CX awards and reporting what I have found, thank you very much! I have about 500K MR Points and a real need for a 7 night hotel stay in Sydney in February to go with the CX awards I booked in May. The property I am most interested in is currently an SPG Category 5 Hotel that will remain in the same category, with points per night decreasing from 36K to 35K. Of course, I cannot attach a certificate to that property now. A Marriott alternative is currently in Category 8 and moving to Category 5, with points per night decreasing from 40K to 35K. I would be just as happy here too. I am going to go ahead and book the Marriott Category 8 Property now. If after August I can move to my first choice, fantastic, if not I am still happy. If I get a refund of the 30K difference, fantastic, if not I am still happy. I certainly don't expect to cancel and get 240,000 points back. That just isn't going to happen. Just so you know I am genuine in my posts, please see the attached for CX availability for JFK-HKG in October 2018. I base my claims on facts, not emotions. What a contrite and annoying response. Last edited by hhoope01; Jul 6, 18 at 6:34 am Reason: Removing non-relevant name calling. Folks, lets keep the discussion focused on Marriott's Travel Package Award. The best place for a specific airline program's strengths/weaknesses is in that airline program's forum. izzik and tth6133 like this. What's up with the GIANT quote? You don't need to quote someone's entire post when you respond to it. Simply delete the irrelevant sections, especially the pictures. This will make it clear what you are responding to and also waste less space. If the post was annoying the first time, what do you think it was the second time? Tanic, 0limits and tth6133 like this. When I explained that they should have explained to me they were going to cancel my original 7-night certificate (expiring end of this month), the rep said that's the only way to extend. And rep refused to reverse this transaction, and I no longer have a 7-night certificate with code 830T redeedm with 270,000. This effectively crushed the value of my 7-night cat1-5 certificate to the lowest refund value of 45,000.